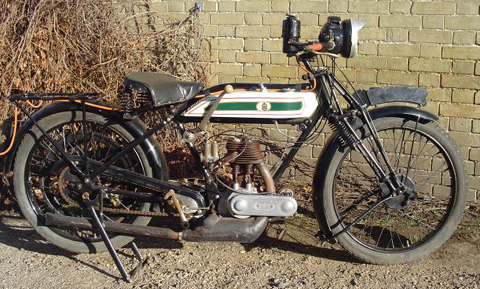 Like many of the Coventry makes, Triumph hadtheir roots in the bicycle industry, beginning motorcycle production in 1902. 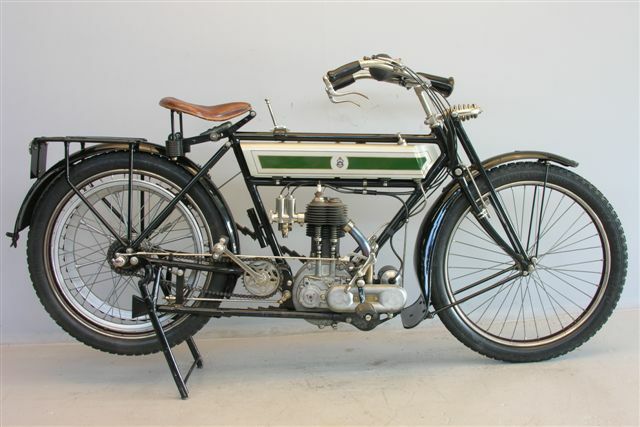 In 1908, they won the single-cylinder class in the TT races, the machine being powered by a 500cc engine designed by one of the German founders of the firm, Maurice Schulte. After the First World War, Triumph were also involved with car production, but once this interest was relinquished when separate companies were established in 1936 the marque became truly succesful. 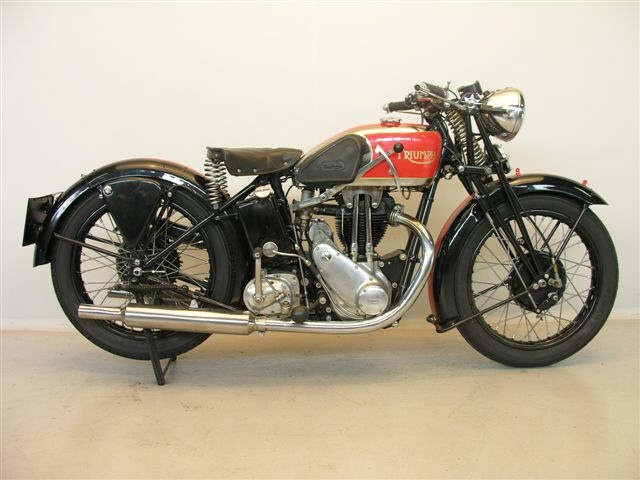 This was due to the first of the famous Speed Twins, launched in 1937 with a vertical ohv engine. This was the ancestor of many great machines produced after the Second World War, notably the Thunderbirds and Bonnevilles. 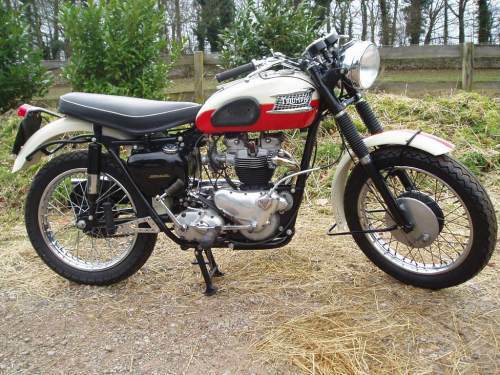 Triumph were the dominant manufacturer in production racing throughout the sixties utilising tuned versions of their already potent Bonneville model to good affect. 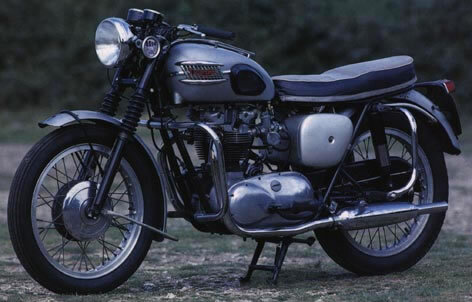 A "Thruxton" Bonneville had been marketed between 1964 and 1965 incorporating a large number of the optional performance parts as standard. 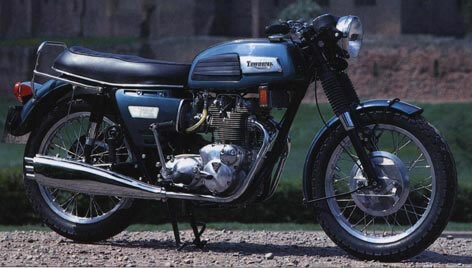 In theory these parts were available to anyone wishing to uprate their machine to "Thruxton" specification; however, the availability was often disputed. 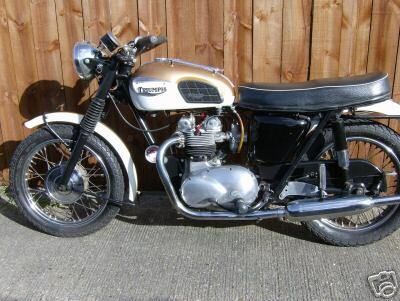 Original "Thruxton" Bonneville's are now highly prized collectors items but the components required to convert a standard "Bonnie" to Thruxton specification are arguably more easily acquired today than they were in the sixties. 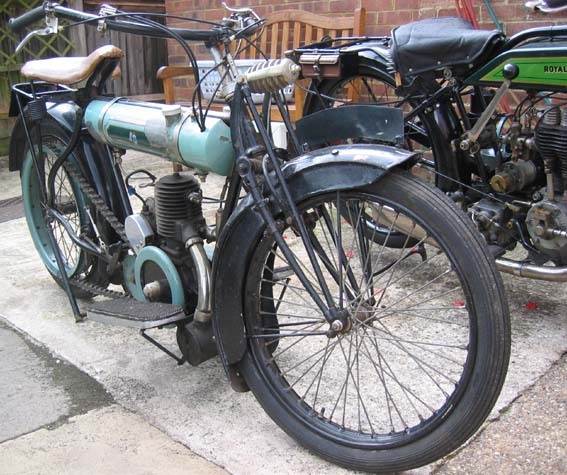 1910 Triumph Hubclutch, 500cc This 499cc 1910 model is in good condition and has a replica Mabon clutch on the crankshaft. The rear wheel is driven by V belt, rear brake is of the block-in-pulley type. Tyre size is 26 x 2½, ignition by the ultra-reliable Bosch magneto. Front brake is like a bicycle stirrup type. Rear brake has a block that rubs against the belt rim. Drive is by belt. 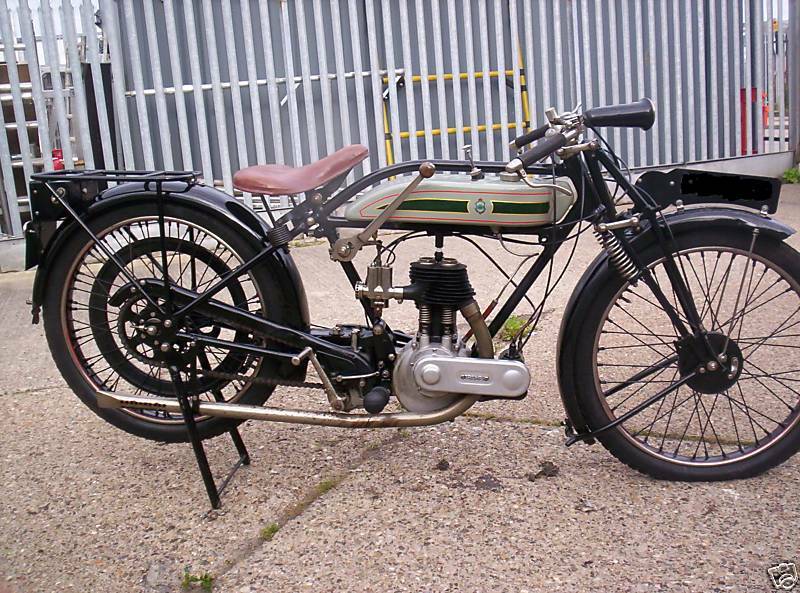 1919 Triumph Junior (baby) 225cc 2-stroke vintage Introduced in 1913 the 'Baby' as it was to become affectionately known offered a small capacity lightweight two-stroke machine made to Triumph's exacting standards. 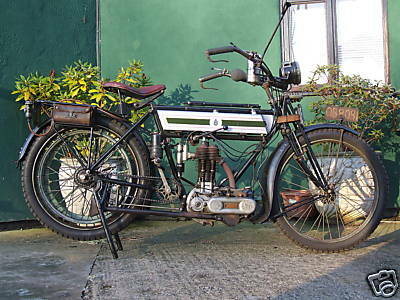 1922 Triumph SD Combination, 550cc The SD (Spring Drive) was in fact a somewhat modernised version of the famous model H, which had grown out of the Trusty veteran Triumph. 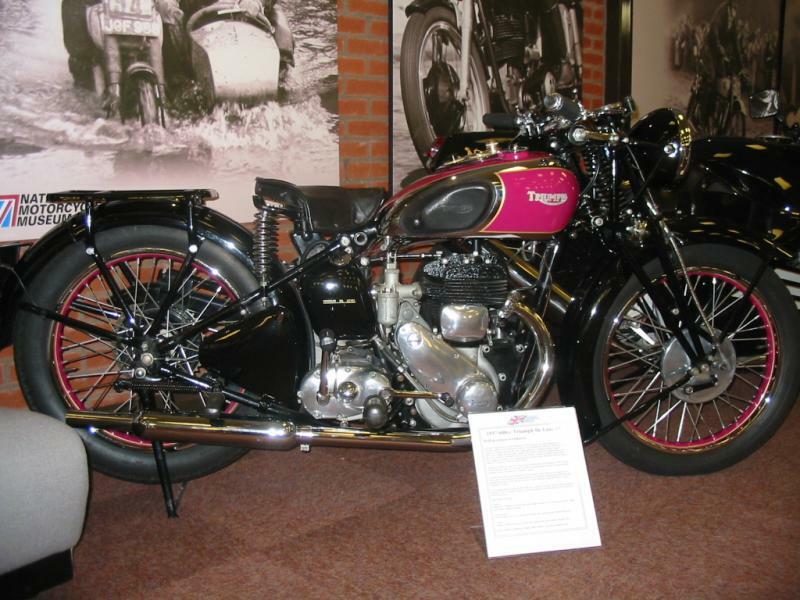 By the mid-twenties belt drive was losing its appeal to many motorcyclists, so Triumph designed a model with chain secondary drive. The primary chain is protected by a well-engineered aluminium case and runs in an oil bath to minimize maintenance of chain and clutch. The powerful 550 cc engine (bore x stroke =85x97) has lots of torque. The machine is equipped with three speed Sturmey Archer gearbox, 26x3 beaded edge tyres and Bosch magneto. There are a full acetylene lighting set and a rear view mirror board. 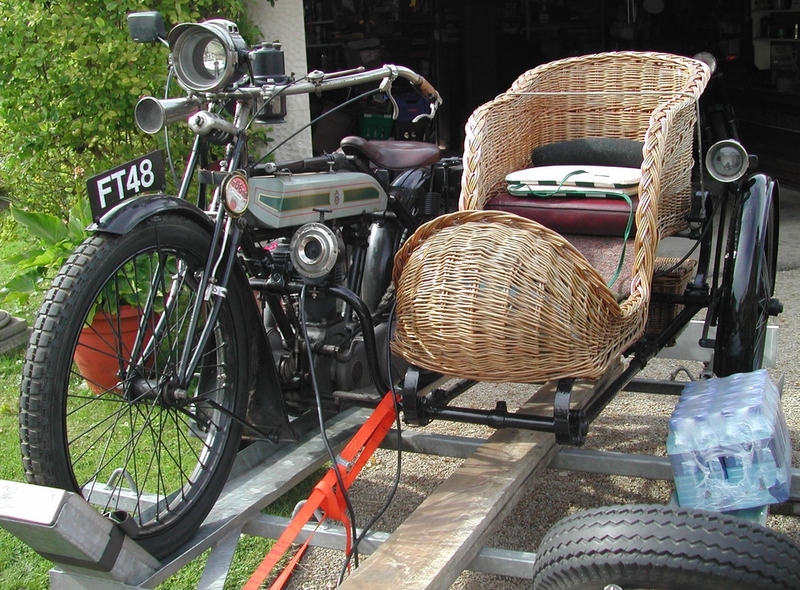 The stylish sidecar is equipped with a windscreen. 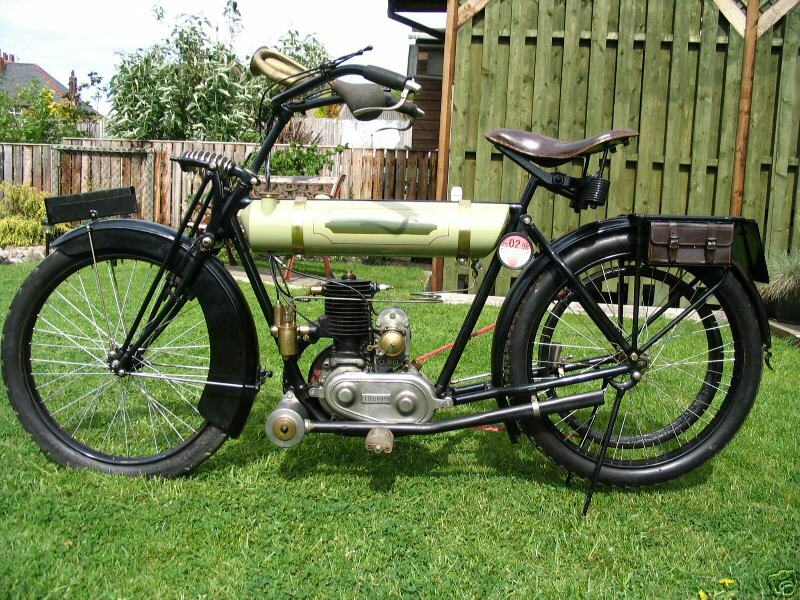 In 1913, a two-stroke, two speed, two-stroke 225cc 'Junior' model specifically for women is announced. 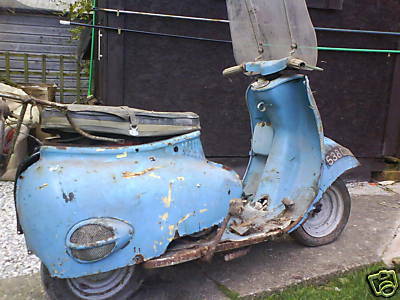 It has a top speed of 35 mph. 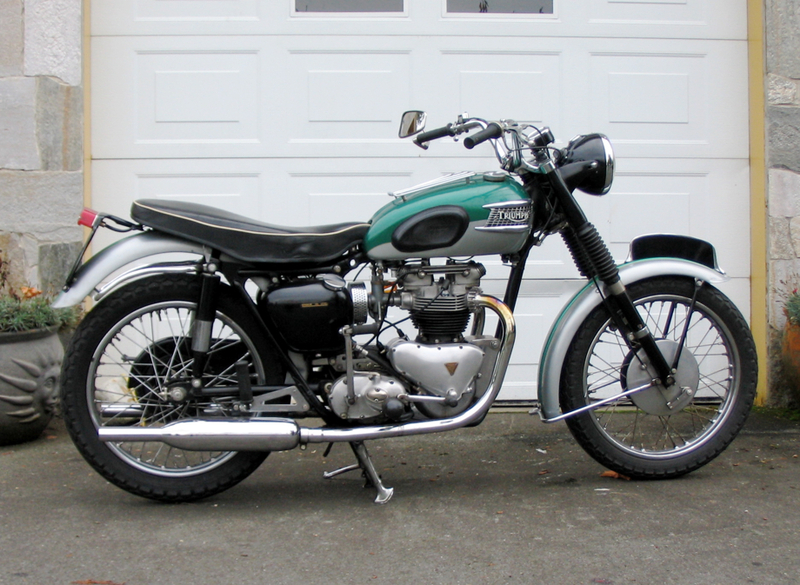 It becomes known as the 'Baby Triumph.' 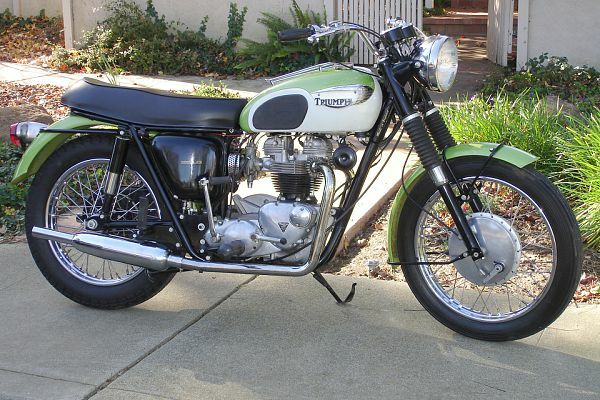 This is the first new Triumph engine since 1910. 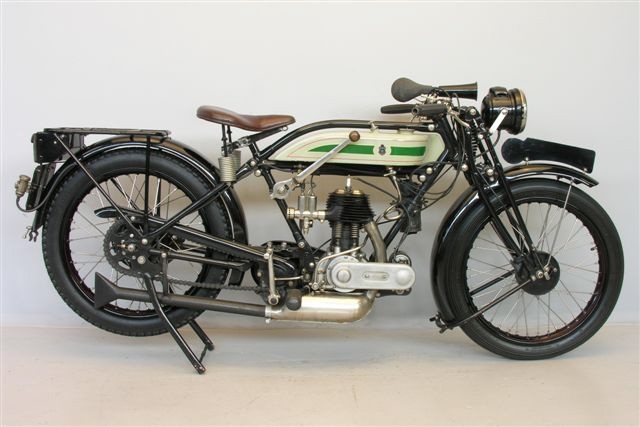 In 1915, the Cleveland Motorcycle Company (USA) built a two-stroke Lightweight which was almost an exact copy of Triumph's Junior model, and continued production of it until 1924. 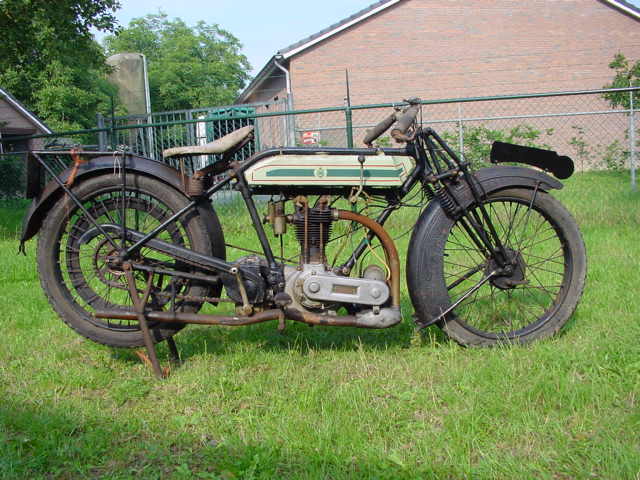 In 1916, Excelsior (USA, owned by Schwinn) built its own Junior clone under license, the L18, upgrading the engine to 269cc. 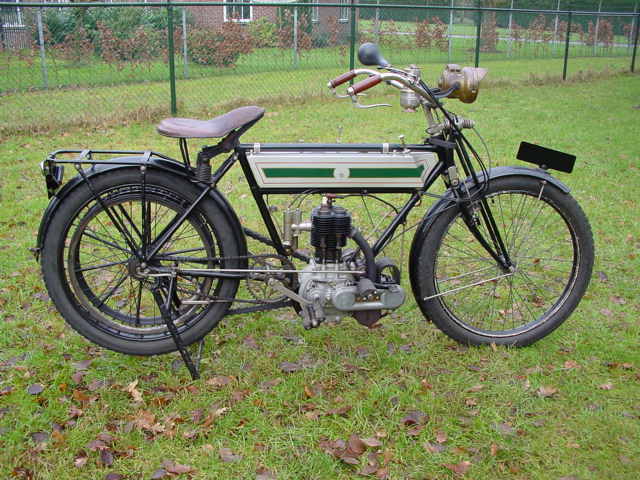 A 269cc version of the Junior was added by Triumph in 1920, and built under license in Germany as well as in USA. 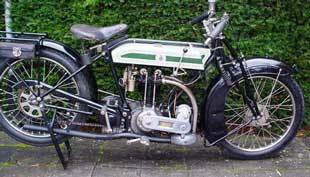 In 1923, the Junior increased to 249cc and received a clutch and a kickstart. (That's the model shown here). 1924 Triumph Ricardo, 500cc The Triumph "Riccy" began to make its appearance in the 1920s as a TT racer, designed by Harry Ricardo. 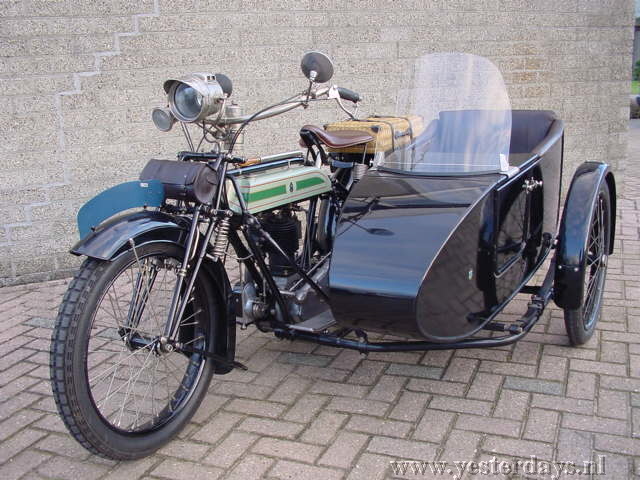 It appeared in the standard production range in 1922. The engine features a 4-valve head, cast iron cylinder, aluminium piston and two exhaustports. 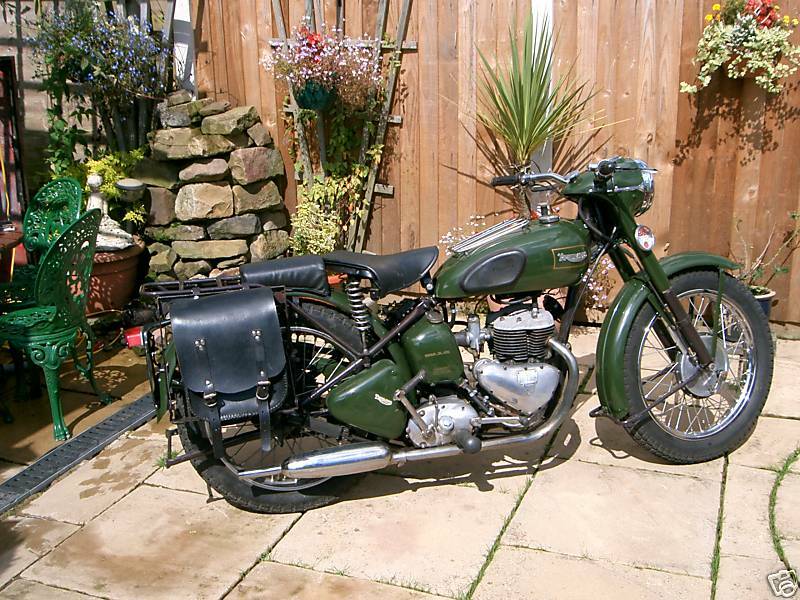 Fitted with an internal expanding front brake and Druid forks, the Triumph "R" was the Top-of-the-range model and is a very sought after superbike. 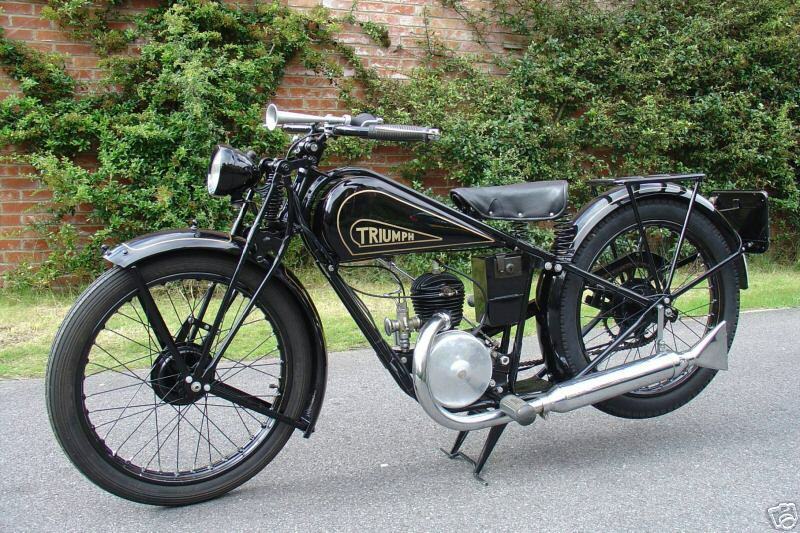 1925 Triumph Model P 499cc. 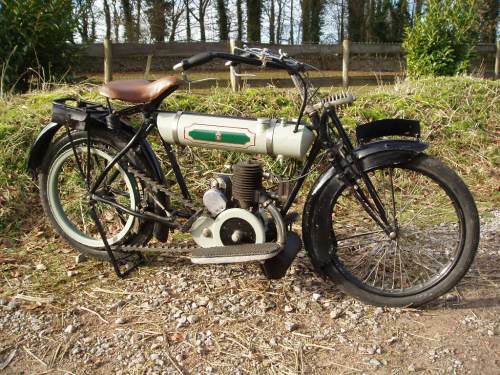 This is an example of Triumph's famous Model P 494cc side valve single that created a sensation when it was introduced in 1925 at £42.16.6d, thereby undercutting every other 500cc model on the market. 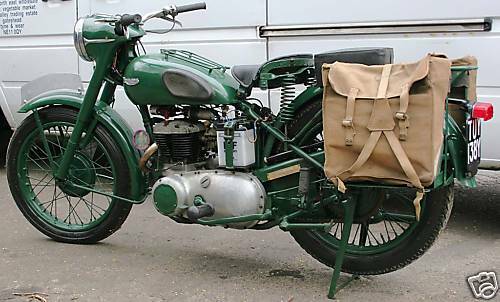 Despite its low price, the model was equipped with a 3-speed, hand-operated gearbox and all chain drive, as well as a carrier and toolbox. 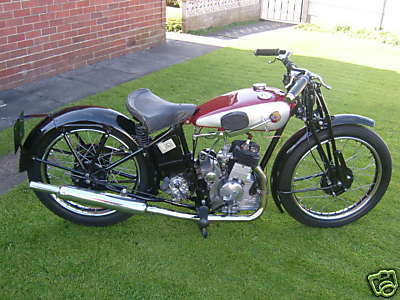 1926 Triumph Model P Image provided by www.BuyVintage.co.uk. 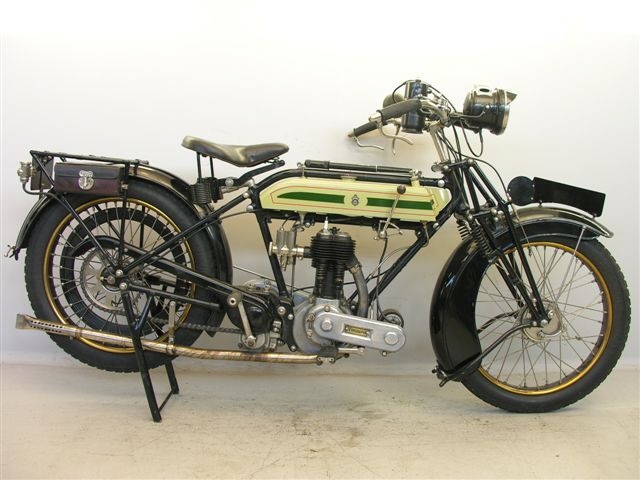 1926 Triumph Model P The difficult trading conditions of the mid twenties prompted Triumph to produce a machine that could under cut its rivals on price whilst retaining the excellent finish that had become associated with the firm. 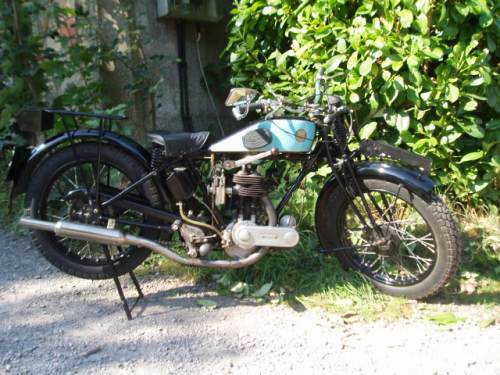 Introduced in 1925, the Model P succeeded in achieving Triumph's aims, selling for £42 17s 6d, a figure that only BSA could approach with their 493cc "3 ¢" at £44. 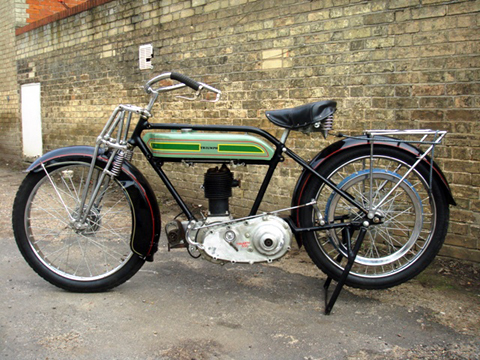 The new machine was entirely conventional with a side valve engine, three speeds and chain drive, although the early contracting band front brake was unusual and somewhat marginal in performance, it was replaced when the second batch of machines was produced, the first 20,000 having been built at the rate of a 1000 a week during 1925. 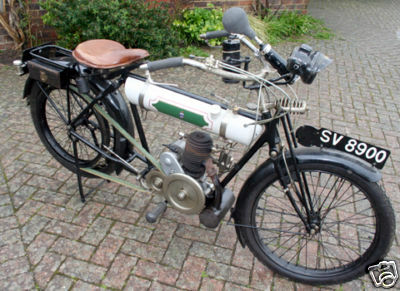 1926 Triumph SD 550cc Flat Tank Image provided by www.BuyVintage.co.uk. 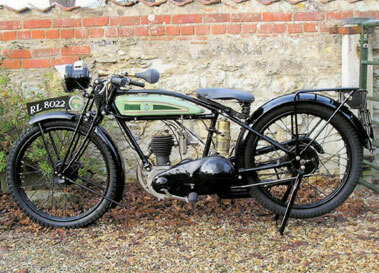 Triumph introduced a number of new models for the 1927 season, including a two valve sports machine to replace the 'Ricardo' and a sporting version of the model P, typed the 'Q', for those seeking less glamorous transport there was a new single cylinder side valve lightweight, the W. This machine is most notable for its unusual displacement of 277cc, adopted to maximise the engine size whilst remaining in the sub 220lbs tax bracket. 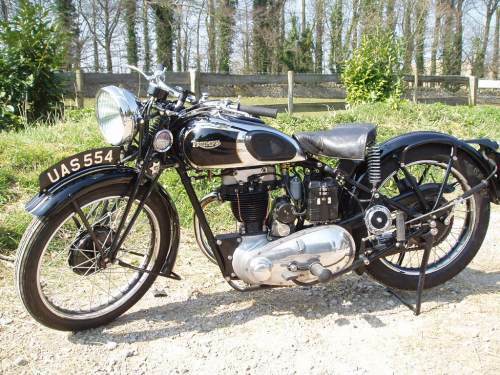 1928 Triumph NSD, 550cc This 550cc side valve Triumph is a real classic in the Triumph range. Bore and Stroke are 84x99mm, 548,5cc. 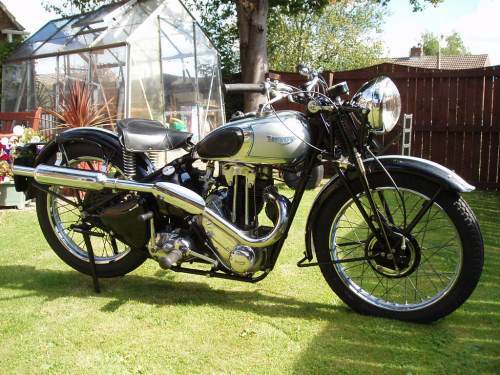 The specification including: the well known Triumph quality, 3-speed gearbox with tankside quadrant, all-chain drive, diamond type frame, shock absorber on the engine shaft, high tension magneto, dynamo and girder forks with central tension spring and steering damper. Tyres are 26x3,25 wired on. 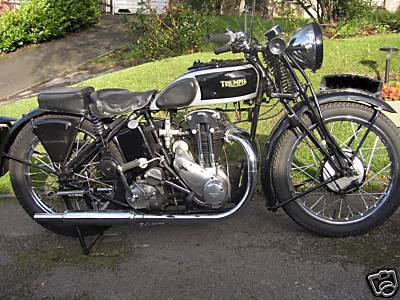 1927 Triumph N The 500 4-stroke single-cylinder Model H was produced by the Coventry firm in large numbers before during and after WW1. 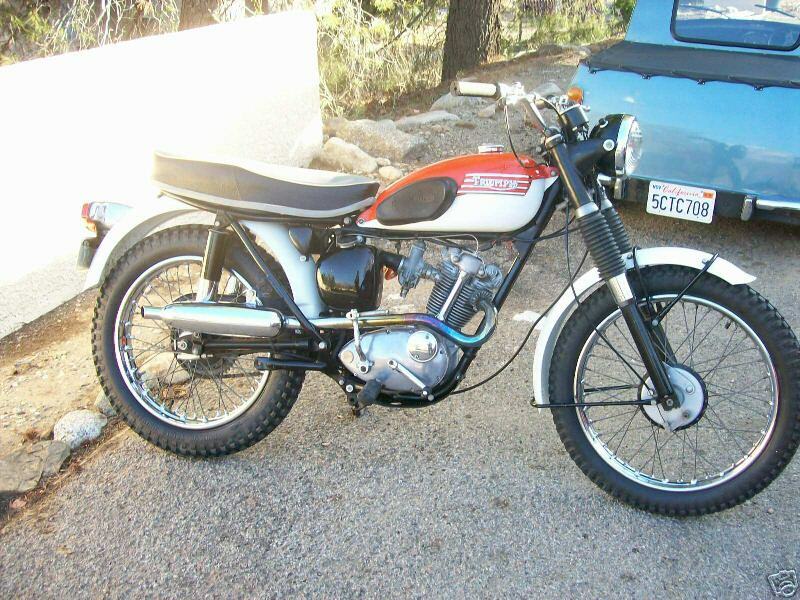 The Model R, with its 4-valve cylinder head layout designed by Harry Ricardo, was extremely innovative, Honda perfecting the concept 40 years later. 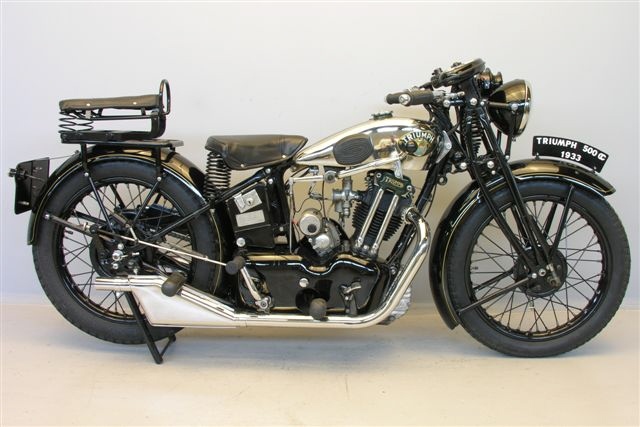 By the 1920s, the Midland firm was co-operating with the German Triumph factory at Nuremburg and producing a variety of machines. 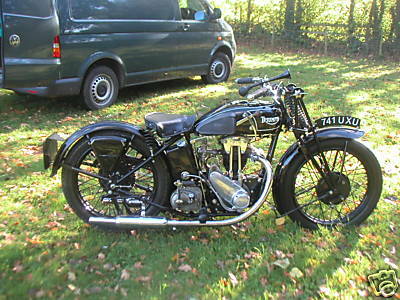 1930 Triumph 500 NT very rare motorcycle indeed, a Triumph 500cc NT from 1930 or Jan '31, at the time it was made, the NT was the fastest bike in the Triumph range, having a twin port over head valve engine 494cc and 3 speed hand change. 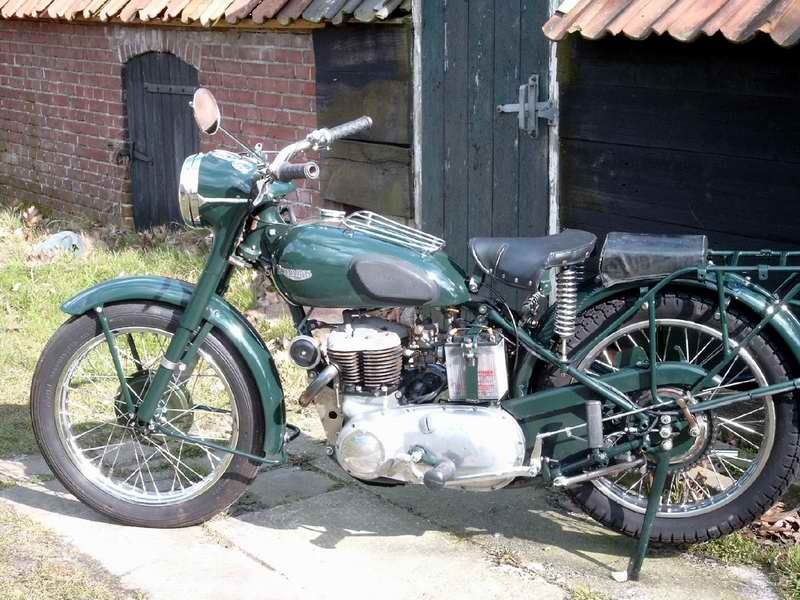 In 1933 Triumph introduced the XO in the 150cc class that attracted a favourable duty rating at the time. It featured an inclined, overhead-valve engine and a three-speed gearbox. House in a conventional duplex-loop frame it was lightwieght, economcal with a top speed of 47 mph. 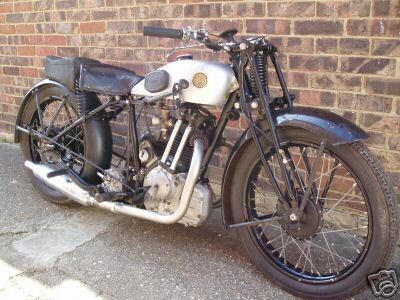 1934 Triumph 2/5 Twin Port Twin Exhaust model. 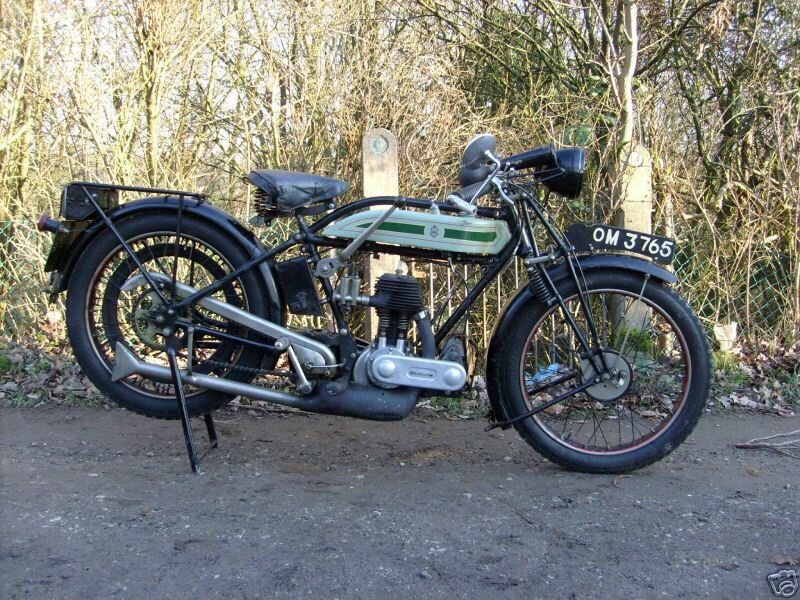 1936 Triumph L, 250cc Designer Val Page came to Triumph from Ariel in 1932. 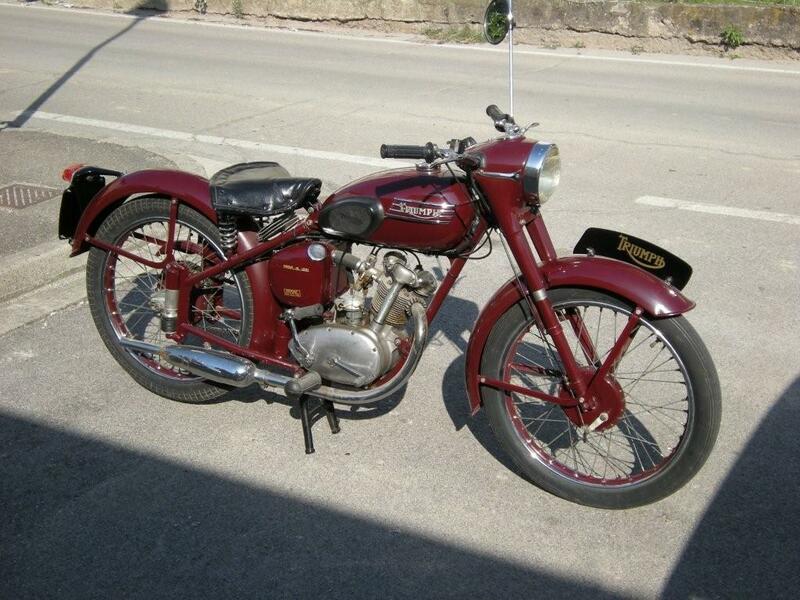 He designed an excellent range of motorcycles, of which the 250 cc model was the lightest. 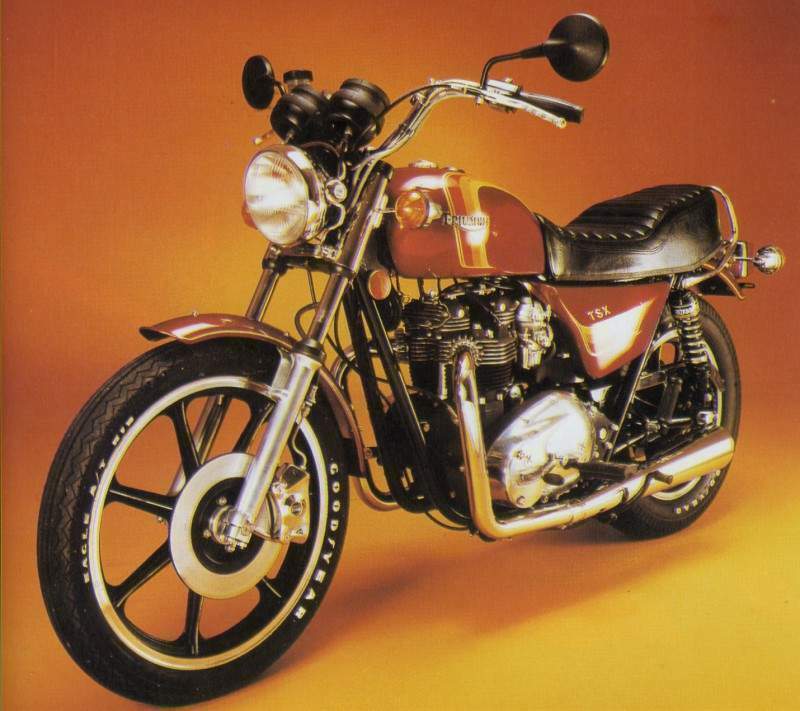 Many parts of this model were interchangeable with those of the 350 and 500 cc models; Page was a sincere believer in rationalization in the production process of motorcycles. The new range was introduced for the 1934 season. 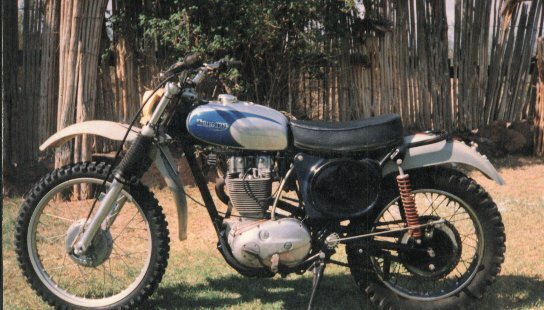 The 250 was a very good motorcycle, but too expensive to make and consequently unprofitable. 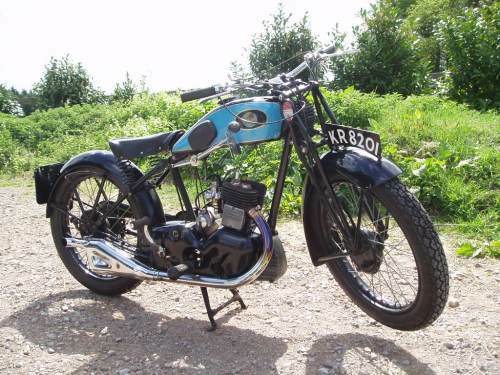 It was said that the company lost five pounds on every two-fifty produced… The machine had a unique integrally forged flywheel and main shaft set up, which made the engine very powerful and reliable: the L 2/1 became a popular competition machine. 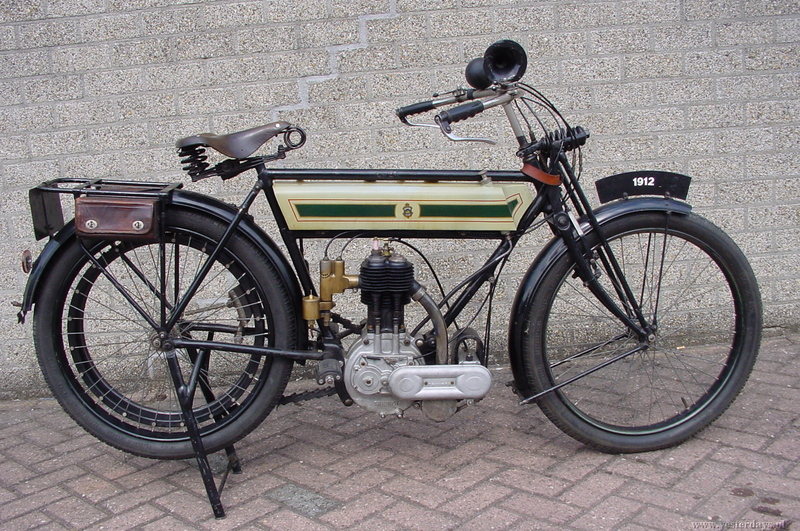 Bore and stroke dimensions were 63x80 mm, identical to the later Speed Twin model: one could say that a Speed Twin was more or less a double Light 250. 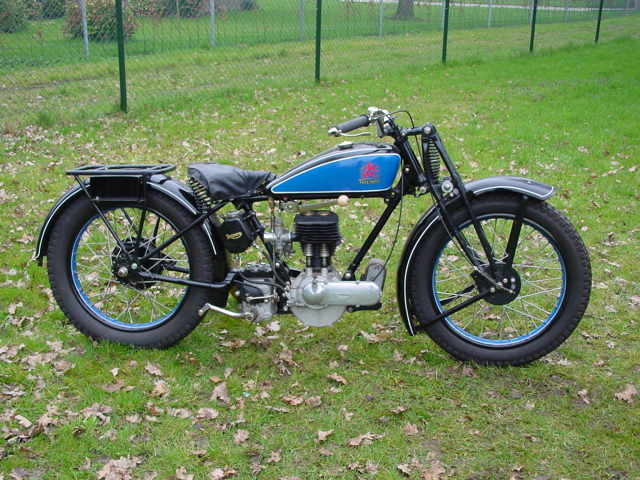 Modern features of the bike were dry sump lubrication and a four-speed gearbox. Lighting is by Lucas magdyno system. Overhead valve single, 70 x 89mm, 7.5:1 compression, 20bhp at 5700rpm. 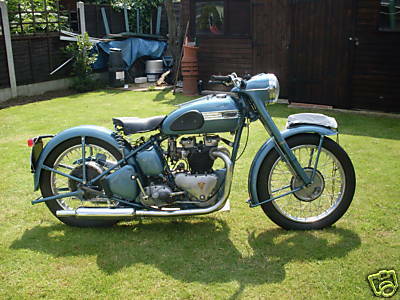 1949 Triumph BDG 250 250cc. 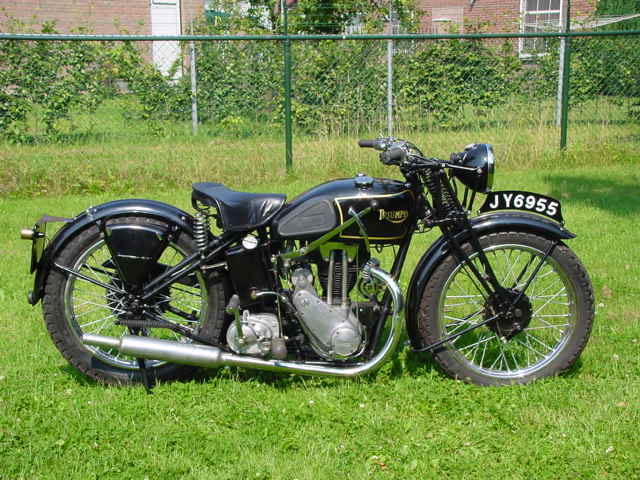 The 1946 Senior Amateur Manx Grand Prix race was won by Irish farmer Ernie Lyons. 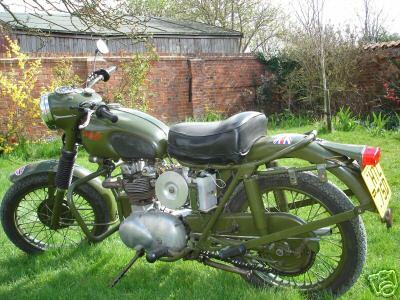 He rode a hybrid Triumph of which the engine had a Tiger 100 bottom-end assembly topped by the square-finned silicon-light-alloy cylinder block and head of a wartime RAF Triumph generator plant. 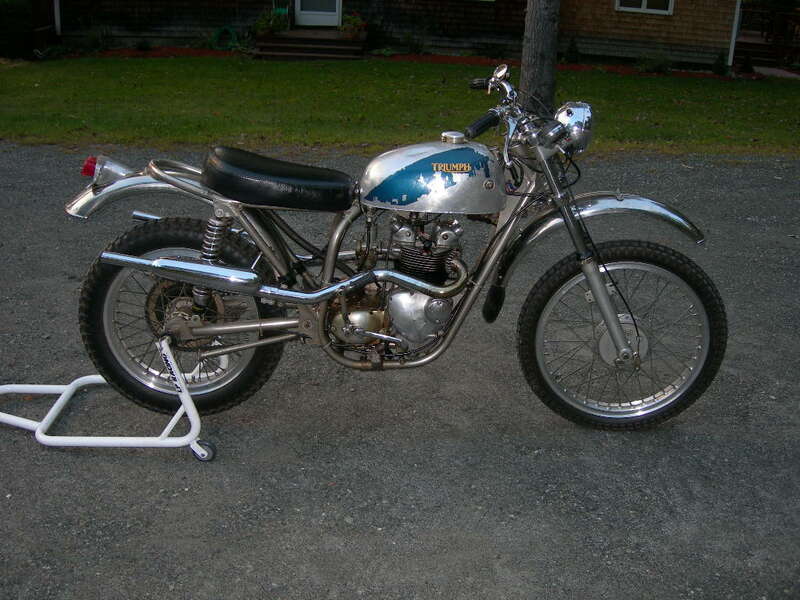 The rear wheel incorporated a prototype Triumph sprung hub. 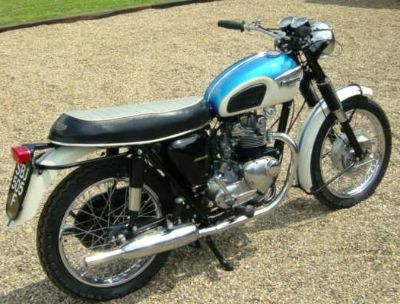 The Manx Grand Prix success led to pressure upon Triumph to produce an over-the-counter racing model based on the Ernie Lyons machine. 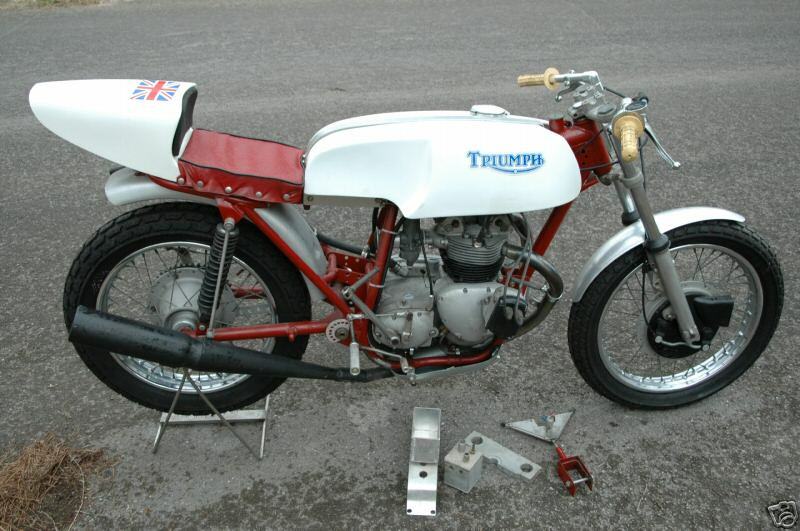 After further racing development in the hands of David Whitworth, the production Triumph Grand Prix was announced in February 1948. It remained in the programme for a few years, in which time some 250 machines were made. 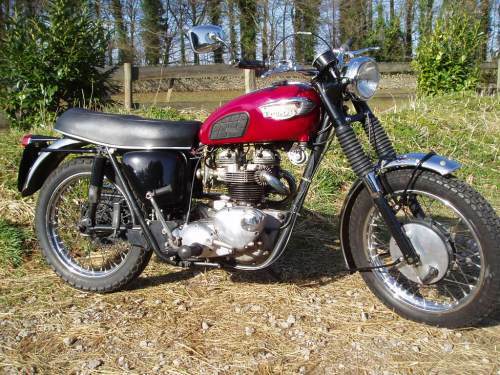 1959 Triumph TR6 650cc Much has been written on most aspects of the Triumph motorcycle and the designs of Edward Turner over the years, and the TR6 is just one development of the original twin cylinder concept in the form of a 650 sporting twin in a moderate state of tune. 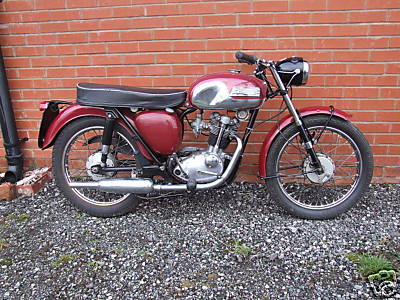 1960 Triumph Tigress T51 175cc, 2-stroke. 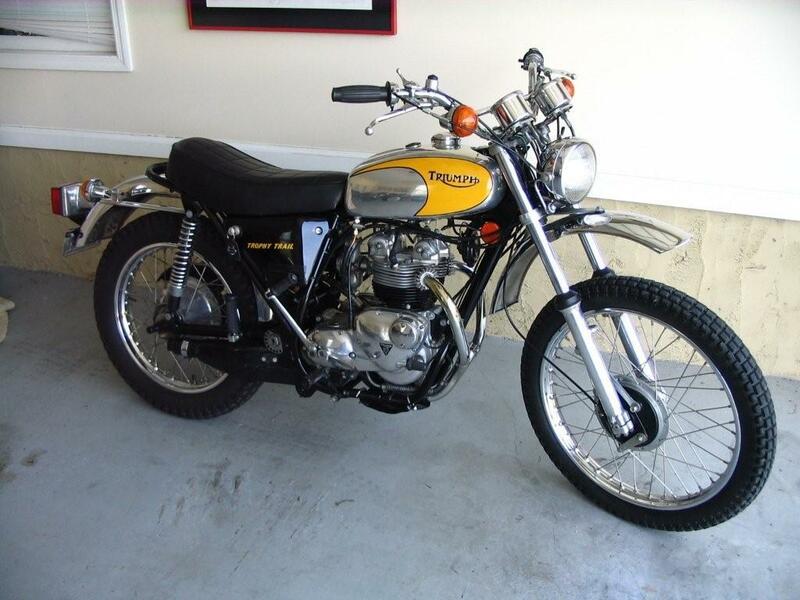 Blue Pearl is Yellow Peril's big brother and was the last of three bikes built by Bill Bragg in the early sixties. 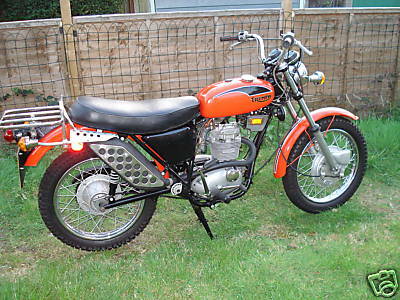 It followed the same basic layout as the earlier bikes except that it had rear suspension to cope with problems of bumpy tracks and a super-charger to improve the power output. Even the innovator, Bragg, was among the first to super-charge Triumph twin engines, and the Allard Car Company helped him to sort out the blower set-up. 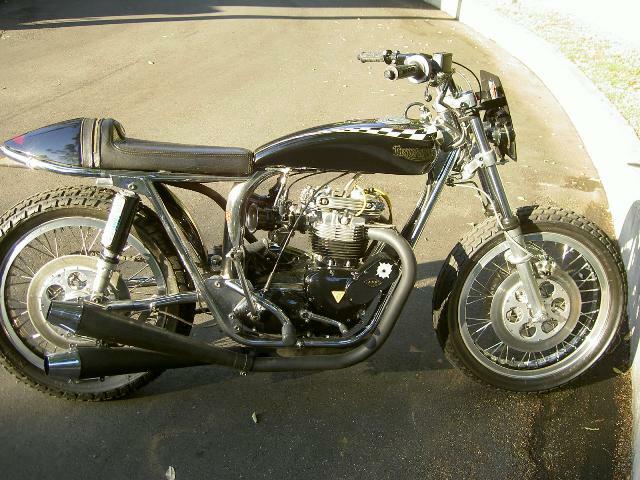 The bike went on to record 11.19 seconds for the quarter mile, very much on the pace for 1962. 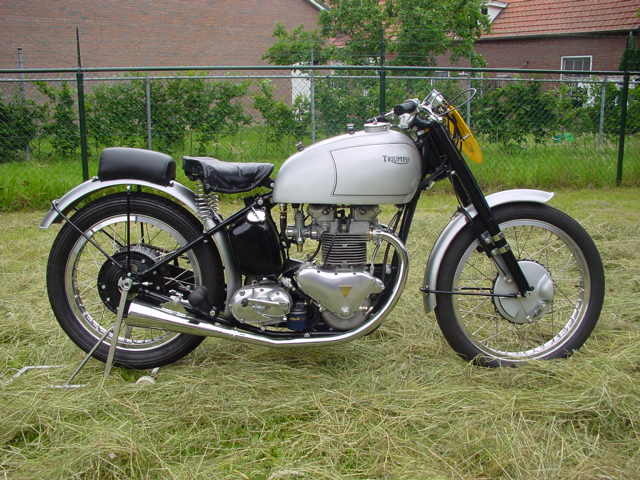 Once again a 650cc Triumph engine is used, driving through a Norton gearbox and clutch. This super-charger is a Shorrocks unit and the methane fuel is fed through a hugh SU carb. 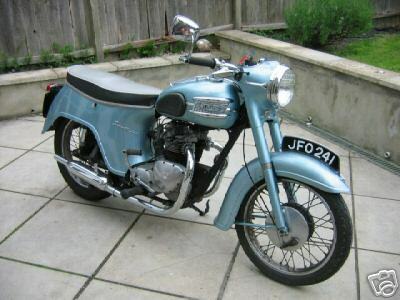 The example offered started life as a 1963 Police specification 6T. 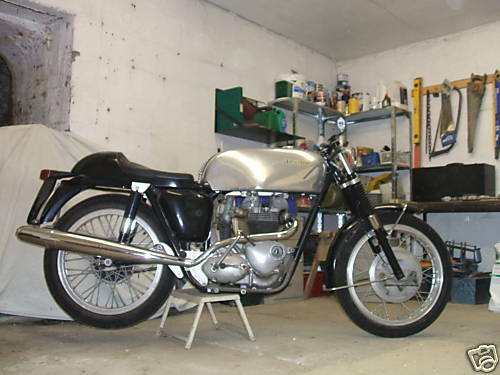 It was rebuilt using 1968 specification forks with all new components and damping as used on the 1968 to 1971 works machines, a 1968 rear subframe and swinging arm and Falcon shock absorbers. 19" wheel rims are fitted, the rear being laced to a quickly detachable BSA Spitfire rear hub which enables a choice of sprockets. The tool box, which compliments the works type oil tank with cutaway, has been made oil tight with breathers and now performs the role of "catch tank". A works replica alloy seat and tank are fitted as is the correct style of Avon fairing with a detachable nose to accommodate the headlight. 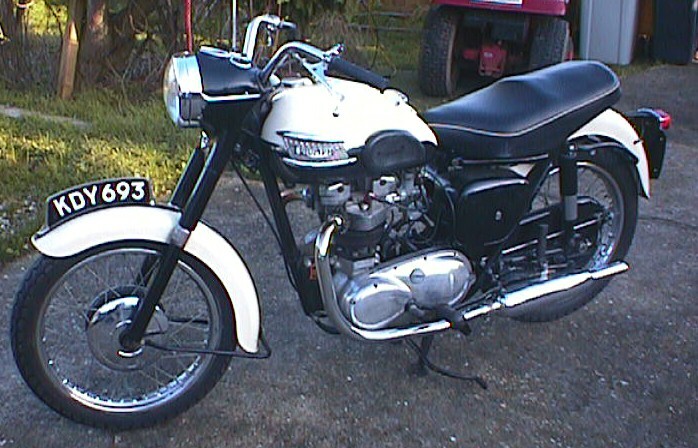 Original new matched speedometer and tachometer provide information for the rider. 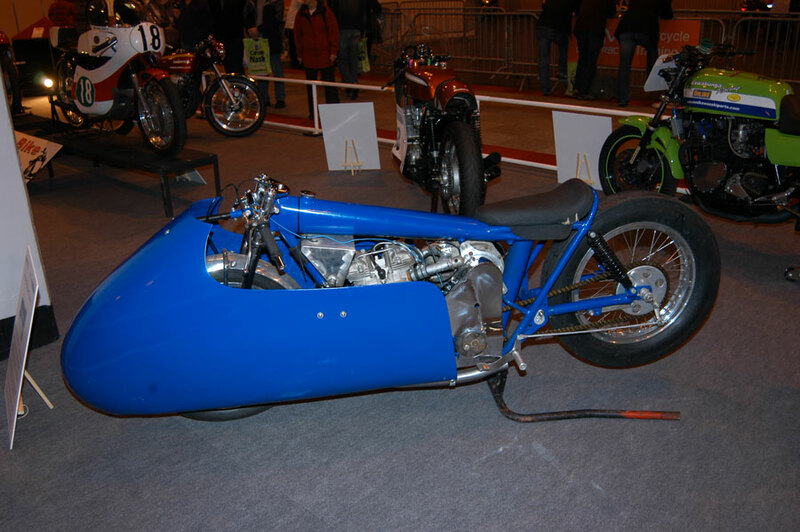 The engine was rebuilt by Andy Alexander and utilises a new drive side crankcase, new bearings throughout, stronger connecting rods, and 10:1 compression ratio pistons with modified skirts. The head has new valve guides with modern valve springs and has been "nicely flowed" whilst "R" type Thruxton camshafts with 3 inch radius followers look after the timing. The transmission features a close ratio four speed gearbox and an alloy clutch drum. 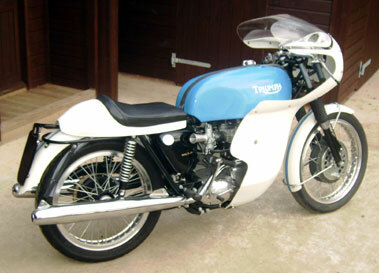 1964 Triumph TRW 2B S.V. 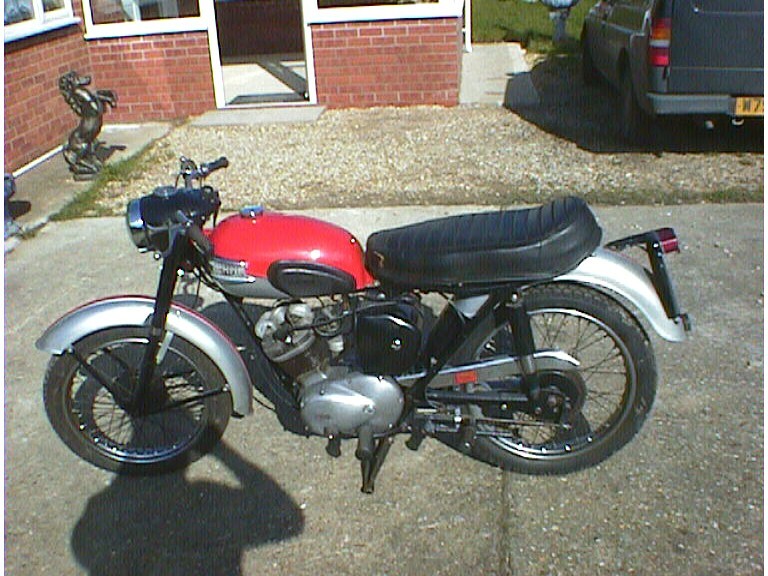 Twin One of the last one's made Oct 1964 for the WD it's still a s.v engine (flat head) and pre unit gear box. 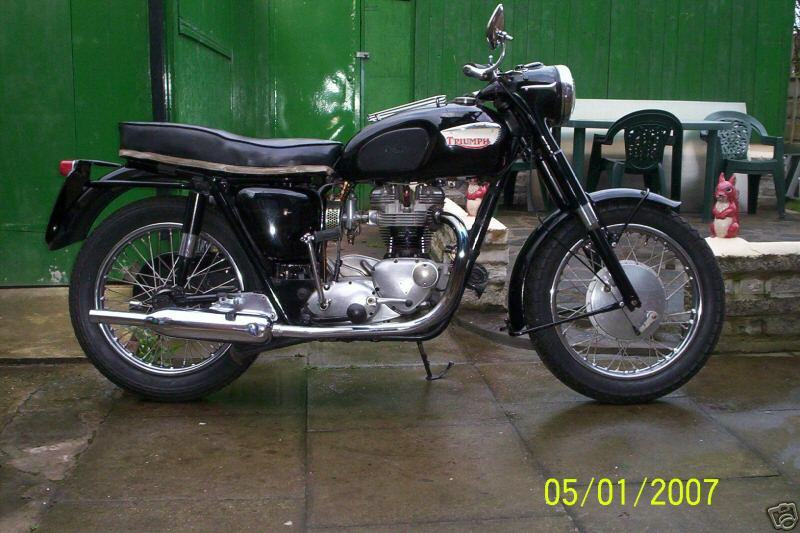 1964 Triumph TRW 500cc side valve PRE-UNIT Twin ex Military Decommisioned and first civilian registration 1983. 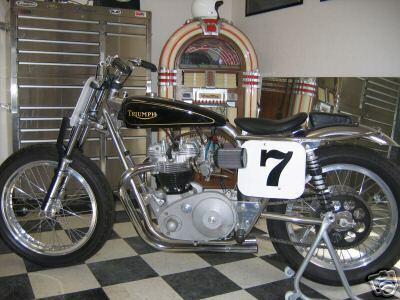 1967 Triumph TT Trackmaster 650cc. 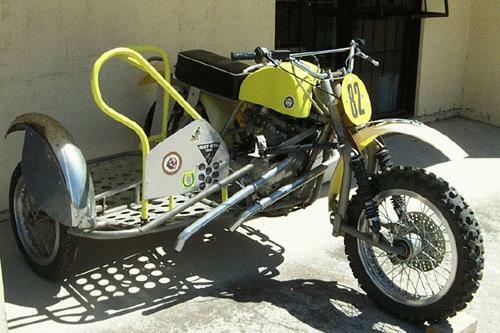 Flattrack Racer, set up for the " mile". Race ready, ARD MAG , Ceriani RR forks, quick change RR hub, Mikuni carbs, polished SS spokes, hi-compression pistons, original bates equipment, Delong # 14 cam, Trackmaster frame. 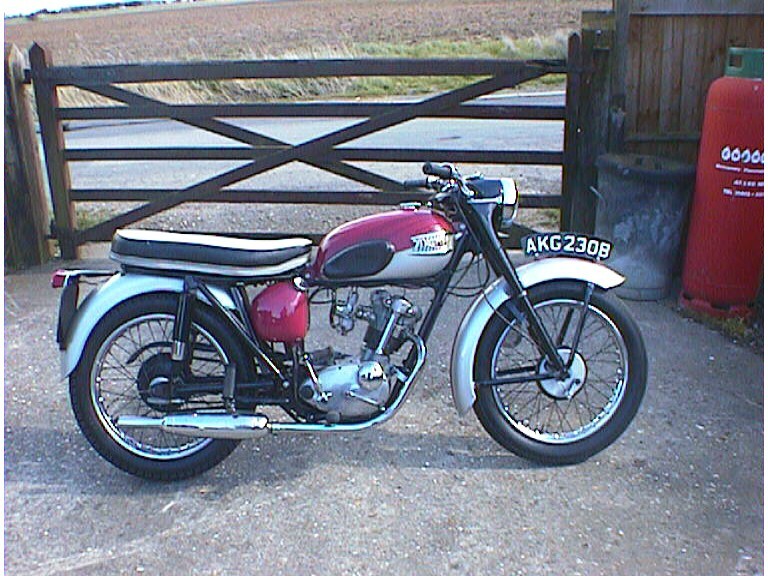 Built at Meriden Works in 1966 and in original colour and chrome. Genuine mileage as per photograph. 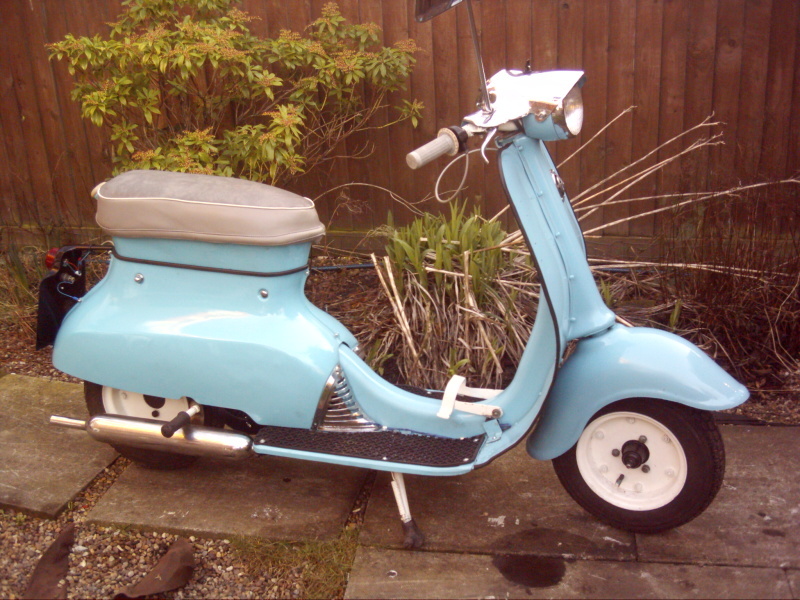 Although intended for police use this machine was never commissioned and remained in it's dispatch state until it's first registration in 1968. 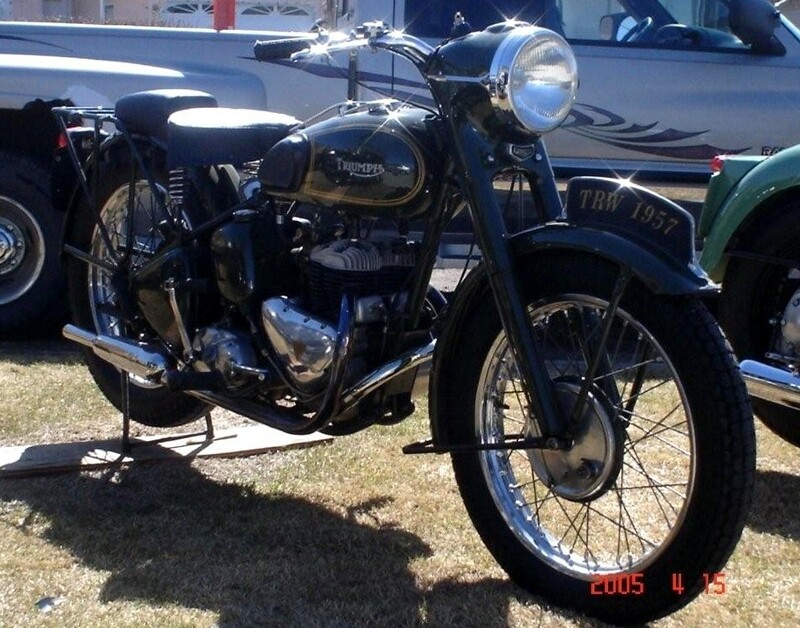 It is the original "Saint" as the police changed over to triumph trophy machines during that period in time, which they also nicknamed "Saint" . 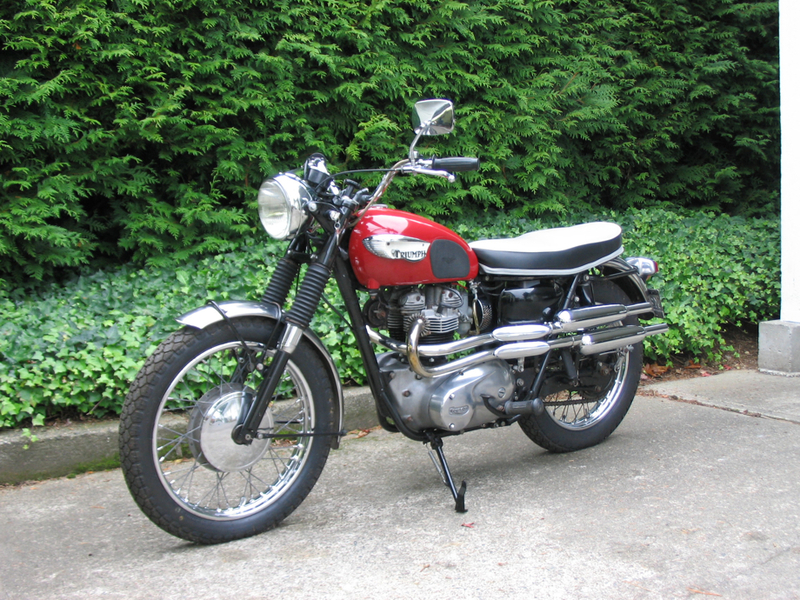 1969 Triumph Cheney 650cc. Built specifically by Eric Cheney for use in the I.S.D.T. 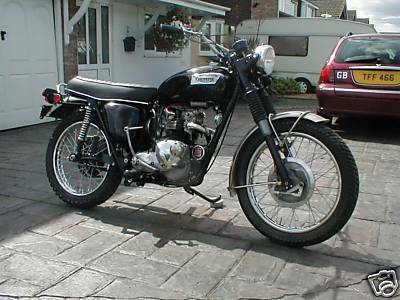 and similar events the Cheney Triumphs featured tuned engines usually of Triumph manufacture installed in lightweight frames. 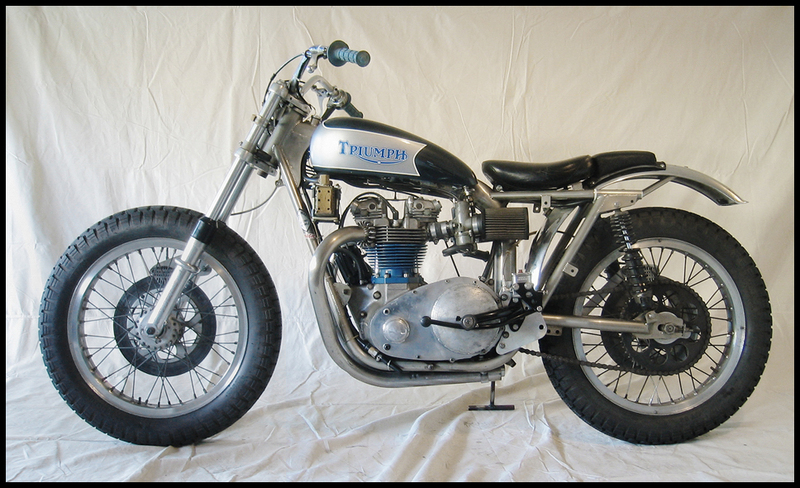 1969 750cc Triumph T120R Bonneville motorcycle engine with a 1967 Trackmaster nickel plated frame. 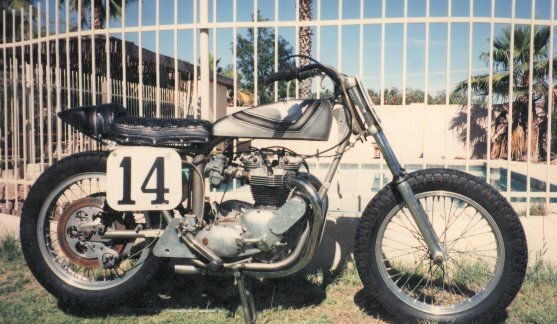 This bike is a genuine vintage race bike that raced at Ascot and other area circuits in Southern California during the late 1960's, early 1970's. 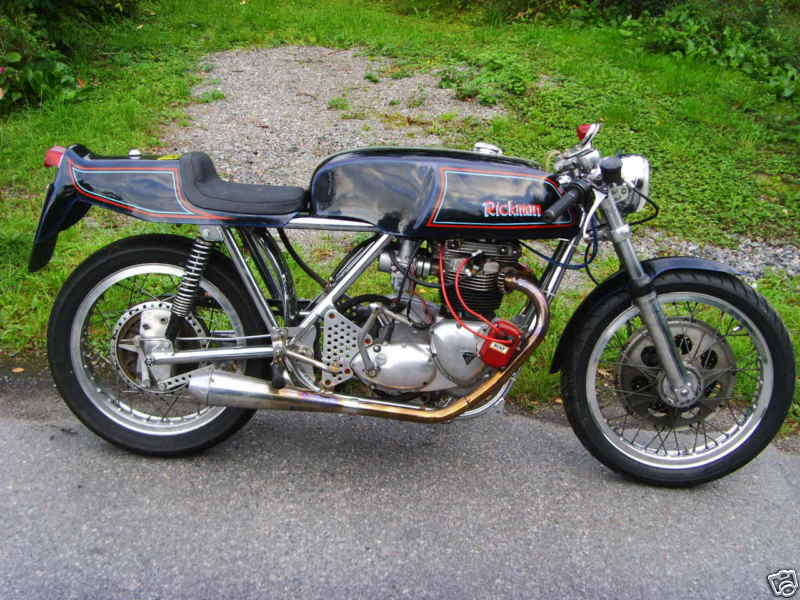 This Rickman was first registered in Sweden 1974. 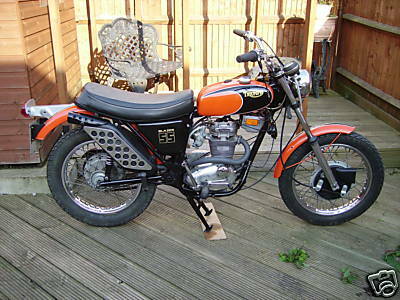 The frame is registered as a 1969. 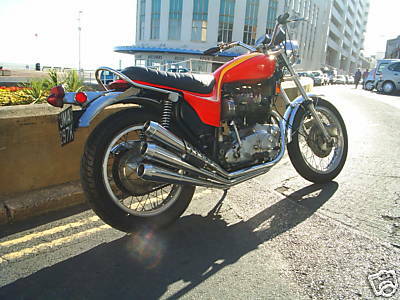 The engine is a Triumph 1977 750cc five-speed engine. 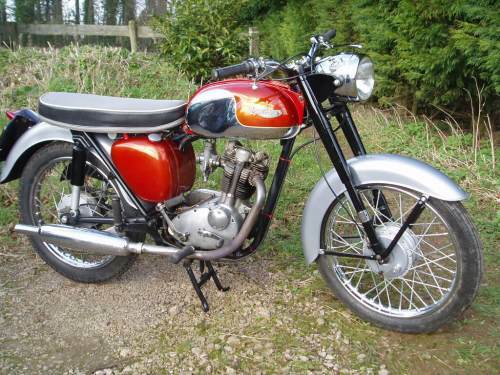 The frame is originally made for racing with an Matchless G50 engine fitted. The first owner didn´t like the finish of nickel-plating so he chromed it. The front end is the original Rickman 41mm fork with original hub with lockheed caliper. The hub is laced to an Borrani 19” VM 2 rim. 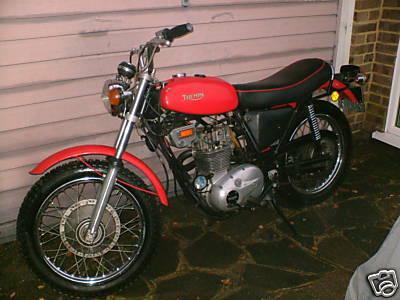 Backwheel is Yamaha TR2B. 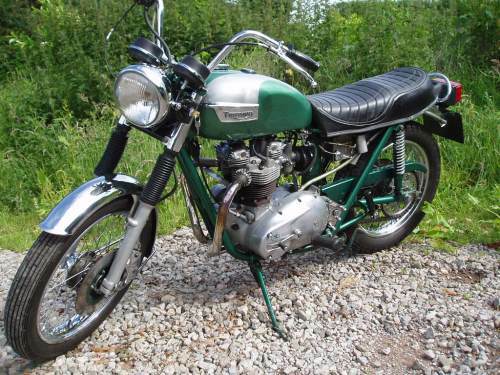 1970 Triumph T100C The T100c is a much rarer machine than the other 500s ie Daytonas & road going Trophies, this is not an adapted Daytona it is a genuine T100c, engine bash plate,folding footrests,small headlight, alloy guards , twin leading shoe front brake etc.This model was intended for the US market only hence they are seldom seen in this country. 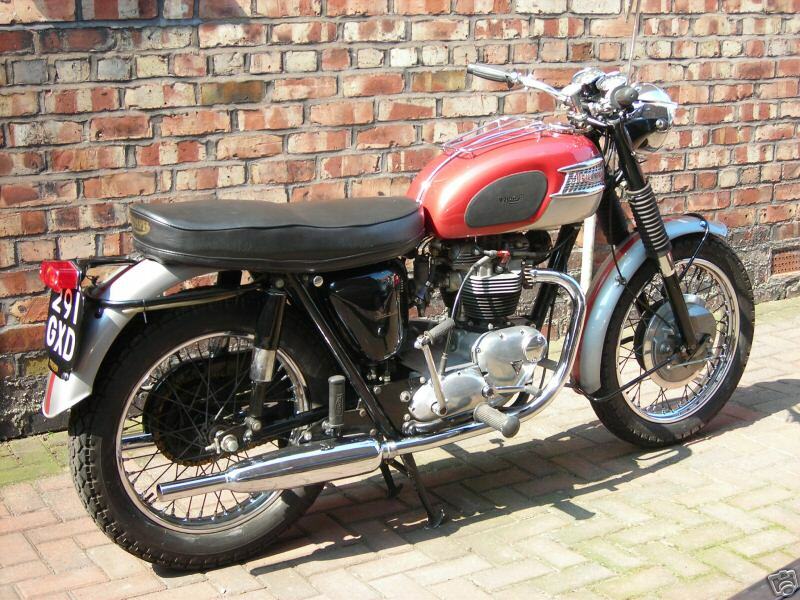 1971 Triumph T25SS Single cylinder 4-stroke lightweight bike. 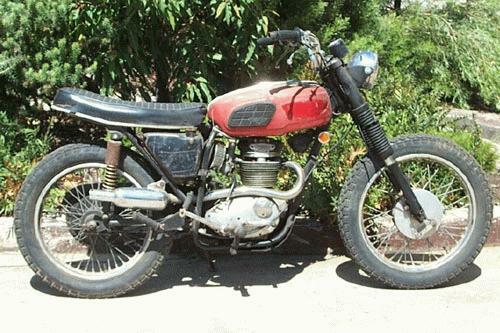 1971 Triumph Trailblazer SS 250cc. 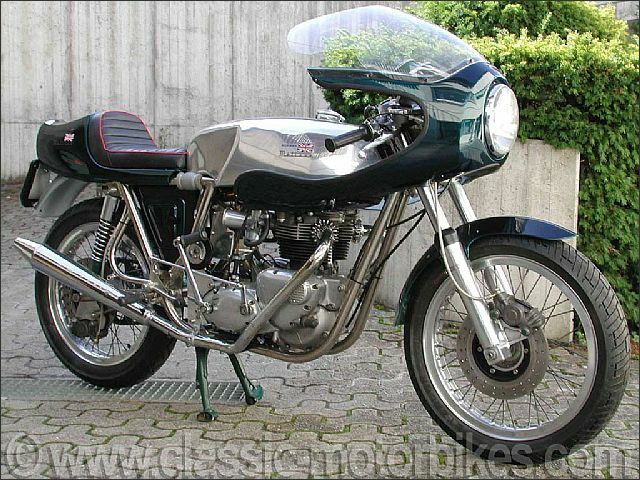 1972 Triumph T25SS Blaser 250cc. 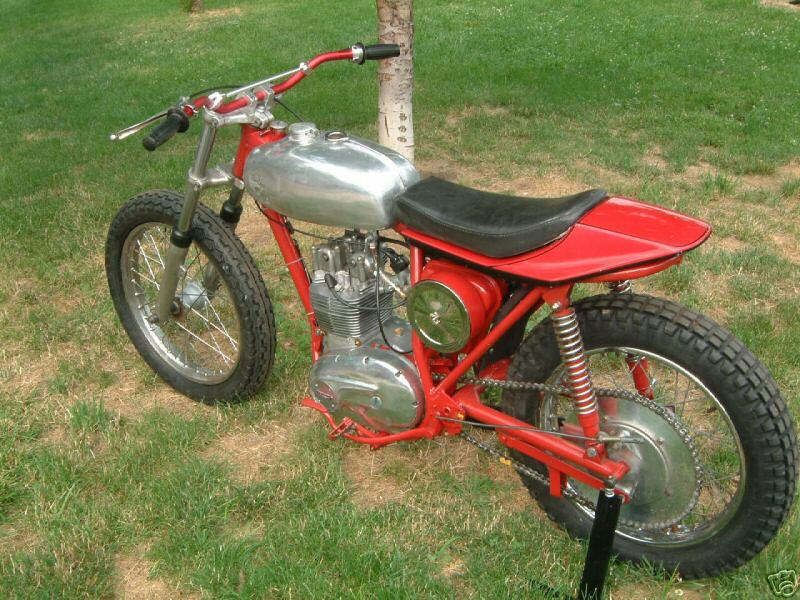 1972 Triumph ISDT Racer Cheney frame. 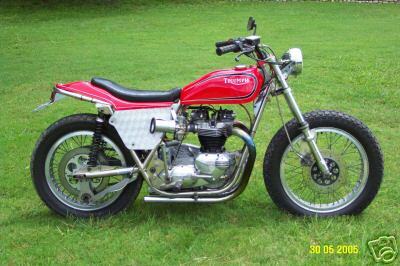 1973 Triumph TR5 T ,"Trophy Trail". 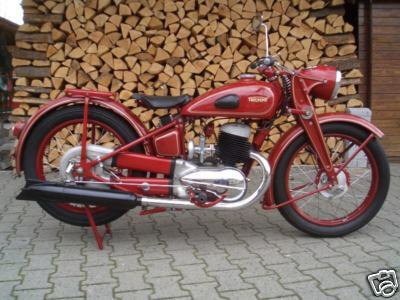 As far as I can tell this is a pretty acurate restoration, (has won an AHRMA concours). 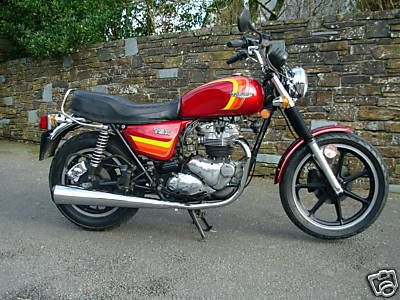 Triumph also painted these red and sold them as the "Adventurer". 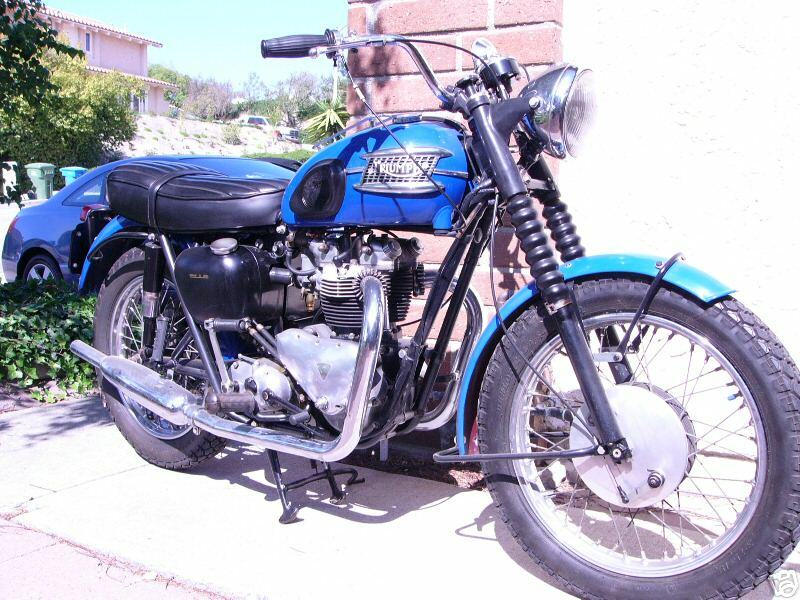 1982 Triumph TSX750 Air cooled, four stroke, parallel twin, four valves per cylinder. 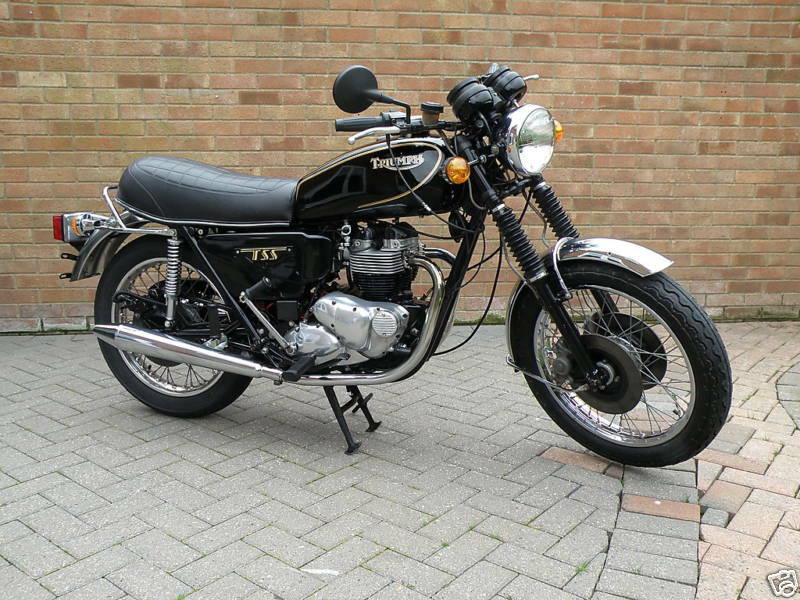 1982 Triumph TSS 750 Air cooled, four stroke, parallel twin, four valves per cylinder. 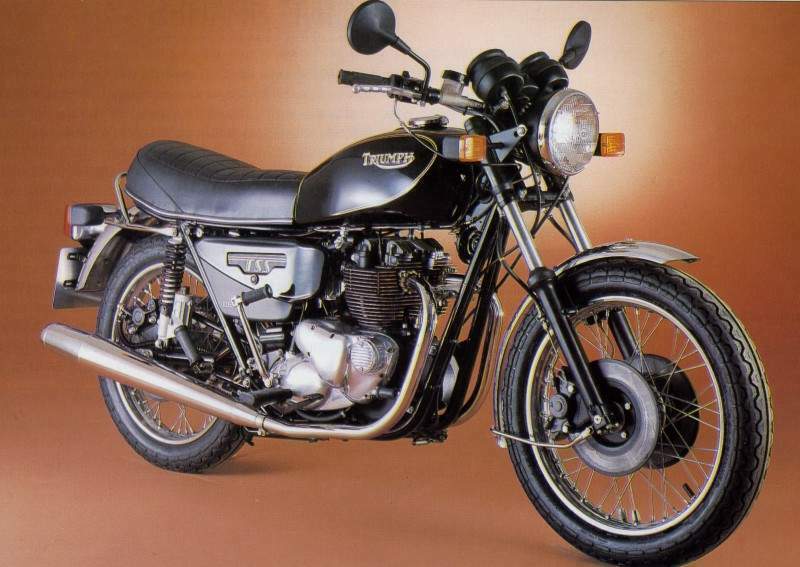 1983 Triumph TSS 750W One of the last Triumphs Made at Meriden Factory in 1982.